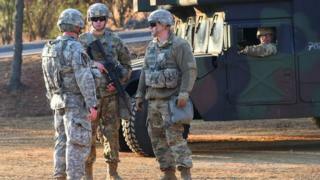 The US and South Korea have confirmed plans to end large-scale joint military exercises amid efforts to thaw relations. Smaller-scale drills will continue, but major planned war games will now not go ahead. A number of exercises were suspended last year after US President Donald Trump met North Korea’s Kim Jong-un. North Korea has always regarded the games as preparation for a military invasion by the two countries. A Pentagon statement said the defence ministers from the two countries had agreed to end the Foal Eagle and Key Resolve exercises in a phone call on Saturday. It is unclear if the suspension is permanent. Critics have said cancelling the drills could undermine US and South Korean military defences against the North, but others say those concerns are unjustified. President Trump has previously complained of the cost of such exercises, although he has ruled out withdrawing US troops from the peninsula. The country has about 30,000 US troops in South Korea. Mr Trump’s second summit with Kim Jong-un in Vietnam this week ended abruptly without a deal.